Common Milkweed (Asclepias syriacea) is an easily recognizable plant with a range that encompasses virtually all of North America east of the Rocky Mountains. 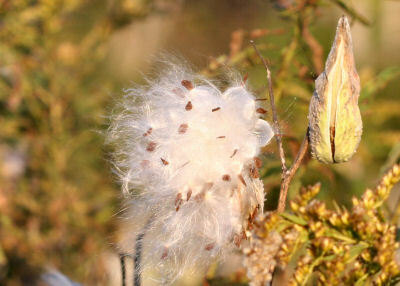 It is one of over 140 species of milkweed, the genus Asclepias. Its common name comes from the white fluid released when the plant is harmed, and the scientific name derives from the healing properties, both real and imagined, for which the widely-ranging plants are used (Asclepius is the Greek god of healing). 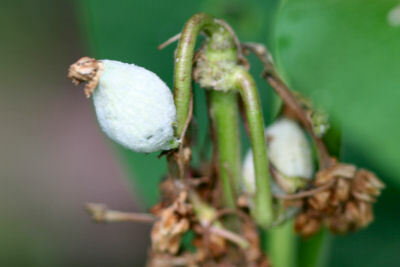 Milkweed is known primarily as the host plant of the Monarch Butterfly (Danaus plexippus) which becomes toxic to predators by eating milkweed as a caterpillar. This toxicity is advertised with bright colors. While carefully examining milkweed plants for the caterpillars and eggs of Monarch Butterflies for a post I planned to write about their life cycle I kept finding other insects instead, making me wonder what it was about milkweed that made it so popular among the six-legged set. Essentially, what I found out after much research is that there are three basic reasons why so many insects like milkweed. First, it has a huge range. 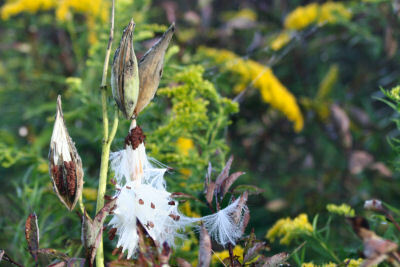 The many varieties of milkweed are spread out from Canada to Central America (and some has spread to Europe). And while many insects specialize on a single species of milkweed, some, like the monarch, are milkweed generalists. Second, milkweed’s tendency to produce prodigious quantities of nectar attracts insects like birds attract me. Finally, the aforementioned transferability of milkweed’s toxicity makes it popular among species that seek this clever form of defense. In addition to monarchs, an entire genus of beetles, Tetraopes, or milkweed beetles, feed on milkweed fearlessly, their bright colors signaling that they are not to be eaten. Interestingly, though milkweed attracts many species to feed on its abundant nectar, most are not good pollinators for the plant. 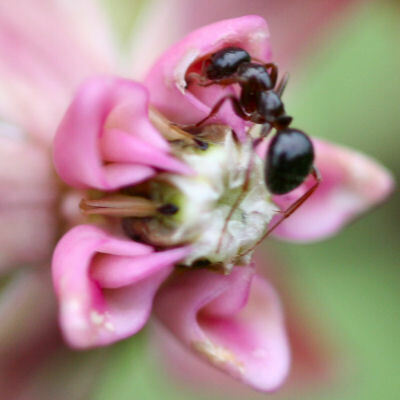 This, according to Wikipedia, is because its pollen, instead of being individual grains, bunches together into pollinia (pollen sacs) that stick only to those insects whose feet slip into notches in the flowers (primarily wasp species serve the purpose). 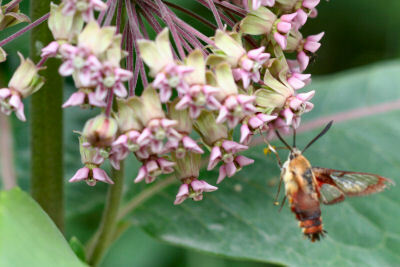 The Hummingbird Clearwing (Hemaris thysbe), a type of sphinx moth pictured above feeding on milkweed nectar, though frequently seen engaging in this activity, is not a good pollinator of the plant. Neither is the honeybee, the ant, nor the Virginia Ctenucha pictured doing the same thing below. Besides the pretty flowers, abundant nectar, and milky sap, milkweed has another trait that, while it doesn’t help attract insects, does help the budding naturalist identify it from midsummer on: it grows its seeds in readily identifiable pods. The pods later burst open, releasing seeds that catch the wind on silky filaments, allowing next year’s crop of this remarkable perennial to be even more widespread. So go out and plant some milkweed. 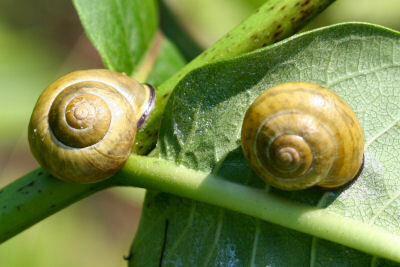 You will enjoy watching every stage of the plant’s life and you will be providing much-needed habitat and food to a wide variety of fascinating creatures, even snails! An excellent & informative postÂ & the pictures are wonderful. I remember “discovering” milkweed as a small child and marveling at the sap on the one hand, and that cottony stuff on the other. I had no idea it was so important in the lives of so many insects. Many thanks! 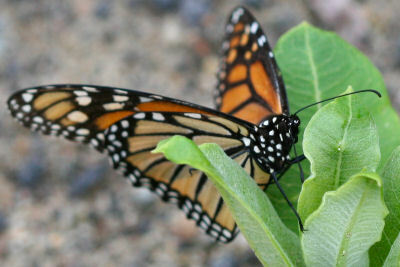 The plant of choice for our favorite Monarch Butterfly! Great shots! This is an exceptionally interesting post. And the photos are great. I plan to tell members of my naturalists’ e-group about it and also mention it on my blog. 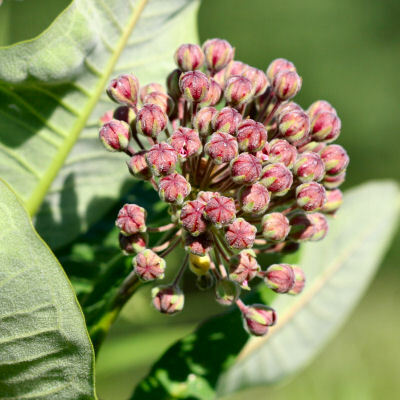 Sadly, however, milkweeds are often listed as noxious weeds in Canadian provinces. I try to get around the ban on common milkweed in Nova Scotia, where I live, by planting swamp milkweed, which isn’t banned. 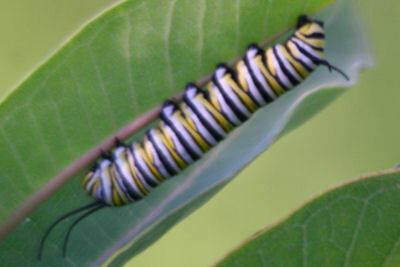 But according to Monarchwatch, common milkweed would be far better for monarchs. 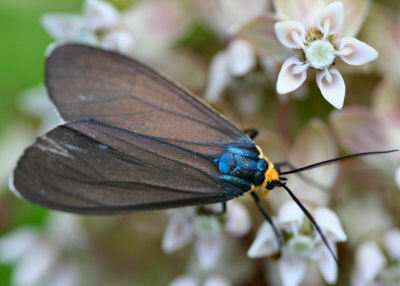 I saw one of those hummingbird clearwings the other day-cool looking creatures!-I never thought about planting milkweed but maybe it’s not such a bad idea. @Larry: Get out the gardening tools! @ Wild Flora: Good links and advice. Milkweed Beetle I see here in Margaretville,NY is shaped like a Ladybug but is much larger,Its about the size of your pinky nail. Got to get camera. We have milkweed growing wild in the front of our house. Years ago, I came home at night and suddenly a wonderful fragrance wafted through the air. I finally realized that it was the scent of the milkweed flowers. Now I always stop to smell the milkweed! I find it fascinating that the monarch caterpillar and other insects eat milkweed plants and become protected from predators by storing the toxins in their bodies…. yet not having any bad effects from ingesting the plant. Thank you for putting this post together. You touched on many good points. I’ve just transplanted a few dozen milkweed I grew from seed this year and hope to begin attracting Monarch and other butterfly. I already have ten others and a very large butterfly weed. Talk about attracting all sorts of wildlife – these things are covered in yellow/orange aphids! I LOVE Monarch butterflies & they come visit my backyard everyday !!! @Debra: Good for the beetles, and, so far as I understand it, not that bad for the plants. 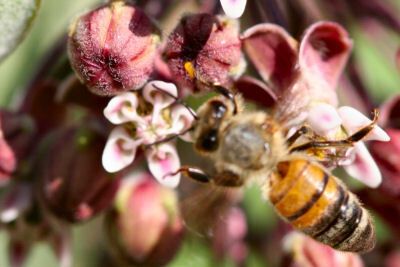 Besides, what is milkweed for if not bug food? What are the tiny yellow granules that are clustered on the seedpods and the under side of the leaves? I thought it was pollen, but then I noticed that they were moving. Yesterday, I saw a caterpillar on one of the plants. 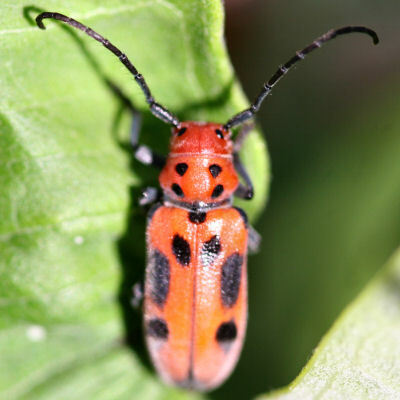 Today I saw 3 insects (red with black markings. I hope you can tell me what the yellow things are. This year the plant had a lot more seed pods than ever before. The yellow tiny pods are Monarch caterpillar eggs !! You can goggle it on the computer & find out how to take care of them. I am in the process of learning how to take care of the eggs & watching them hatch. A lot of these caterpillar eggs do not make it, because other insects eat them before they have a chance to make it in this world! The Monarch Butterfly numbers are decreasing, we all need to work together to help them !! You can also google this to find out how you can help !! They are a beautiful creation that needs are help.